With Skilled Companion Lissa by Kimberly’s side, people would approach them and make conversation. Before Lissa, this rarely happened. Lissa was an attention-grabber. 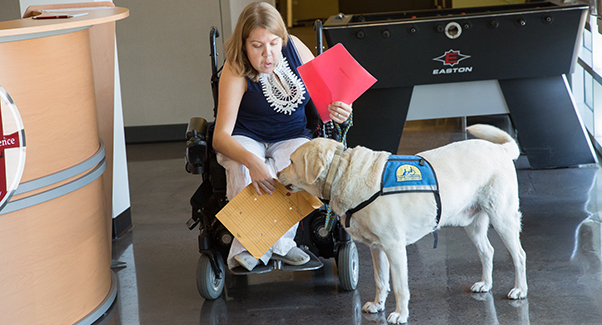 When Kimberly turned 18, she and Lissa got certified by Canine Companions as a service dog team. That big step enabled Kimberly to take her assistance dog wherever she went without her parents, including to Chapman University in California. If Kimberly dropped a pencil, Lissa retrieved it for her. If she needed a door pulled open, Lissa helped. Lissa even activated light switches. Of course, Lissa continued helping Kimberly make friends, as well. Today, Kimberly is partnered with Service Dog Karsten. Karsten does everything Lissa did for Kimberly with the addition of one specially-trained skill: he pulls her manual wheelchair and assists her when she fatigues. “He runs fast!” says Kimberly. “It’s really fun.” Karsten performs many tasks to assist Kimberly as a working professional in an office environment, such as picking up dropped papers, carrying files, and ensuring she gets to meetings on time by pulling her wheelchair.